Need help keeping your New Year’s resolutions? 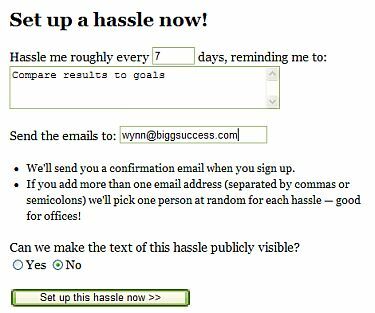 Hassle Me is a leading-edge tool that will remind you of your goals and “hassle” you at random times within pre-determined parameters. …. it nags the ones you love so you don’t have to! Take out the garbage. Pick up your room. Do your homework. Go for a walk. The possibilities are almost endless. Hassle Me was created by Chris Lightfoot and Etienne Pollard of mySociety, a non-profit organization that provides people with simple on-line tools to fulfill their civic duties and serve their communities. They acknowledge that the concept of Hassle Me shouldn’t work. They used a similar application to encourage people to post to their blog, and it was successful! So they developed Hassle Me. Set it up today so you’ll be ready for the New Year!